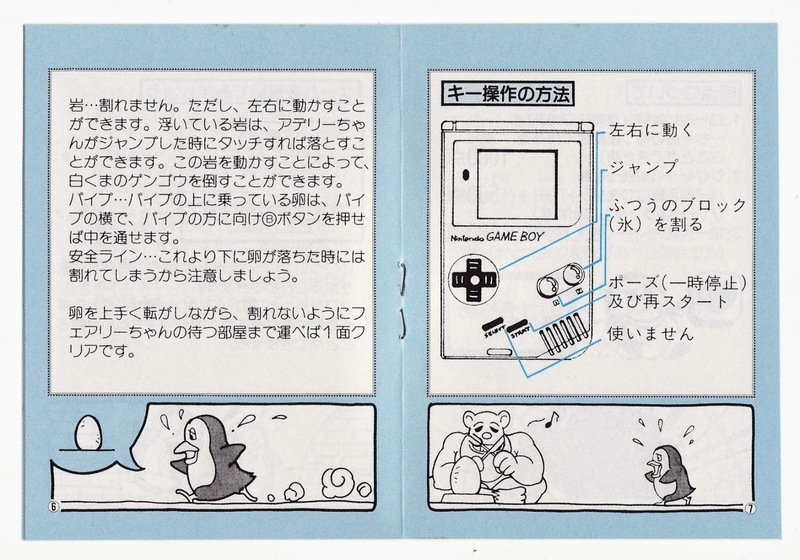 Something you may have already noticed about the Japanese GameBoy instruction manuals I've been sharing here as of late is that a good number of them aren't all that appealing. 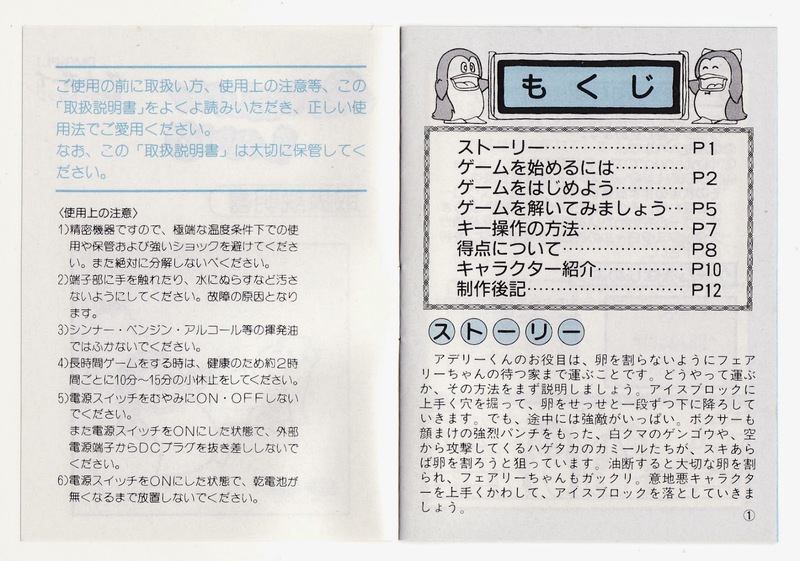 I'm publishing "Manual Stimulation" posts about them anyway, though, because most of these games are fairly (if not completely) unknown outside of Japan and I'd like to do my part in helping educate Westerners about them, if at all possible. Plus, very few (if any) photos or scans of the manuals, packaging or cartridges of these games find their way onto the Internet these days, and I hate the idea of them eventually becoming lost to time. 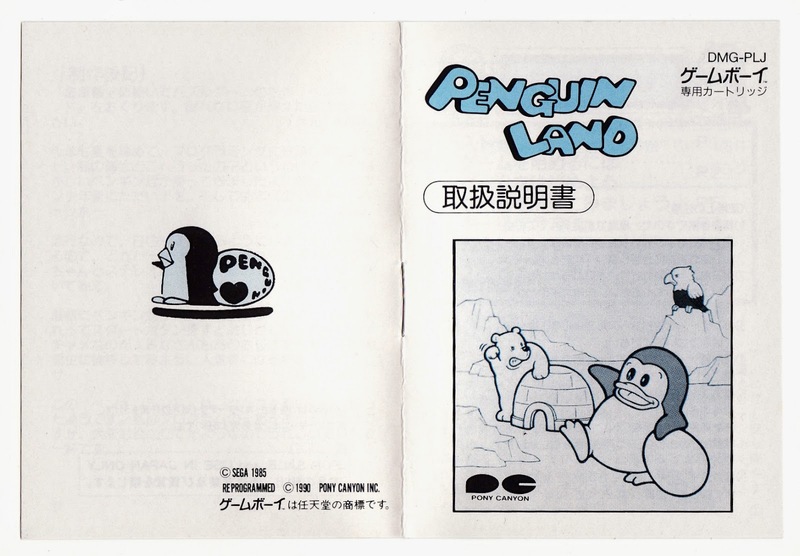 With all of that said, let's take a gander at the instruction manual that was produced for Pony Canyon's GameBoy port of Sega's classic Doki Doki Penguin Land, shall we? Things certainly get off to a good start, if you ask me. 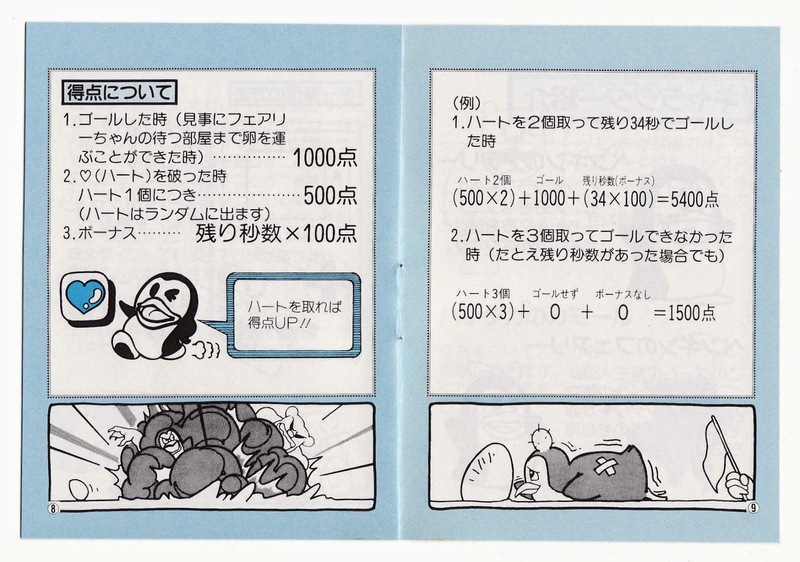 That splash of blue in the logo is a nice addition, for instance, although it pales in comparison to the adorable illustration that graces the manual's back cover. 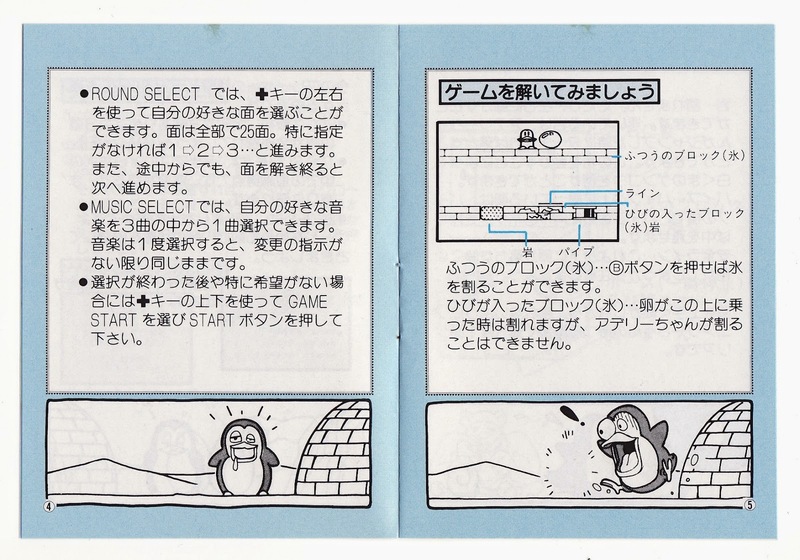 The illustrations that top the manual's "story" page (above) are pretty adorable, too. How can you add a bit of "oomph" to an otherwise humdrum instruction manual? Have a cute comic strip run along the bottom of each page, as is the case here. 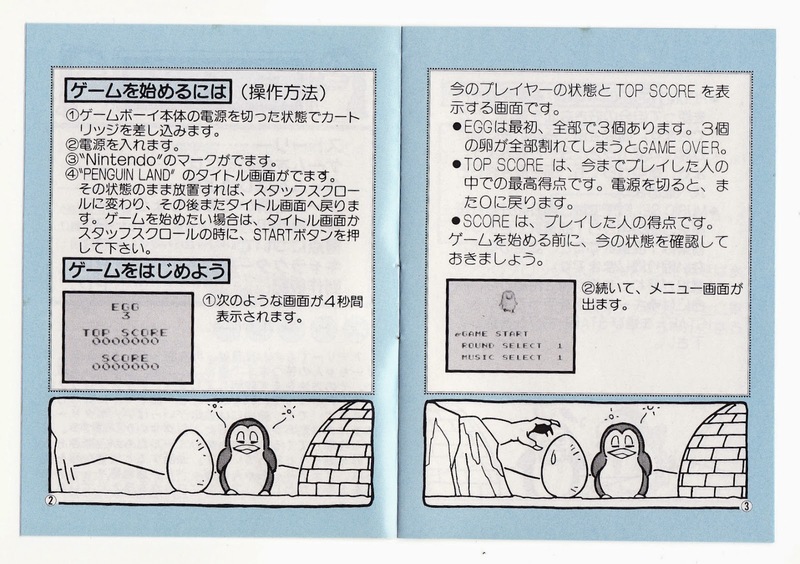 In fact, said comic is about all that's worth looking at when it comes to the latter stages of the Penguin Land manual--although I guess some folks (who can understand Japanese, of course) may also like the parts that explain how to play this unique puzzler-platformer. Thankfully, this game is extremely easy to pick up and play, so don't avoid picking up a copy (or, um, downloading a ROM) of it if you don't understand a lick of Japanese. A couple of seconds of trial and error are all you're likely to need to come to grips with how it controls and what the point of it is. And here (above) the comic strip ends--seemingly on a positive note for the game's protagonist? 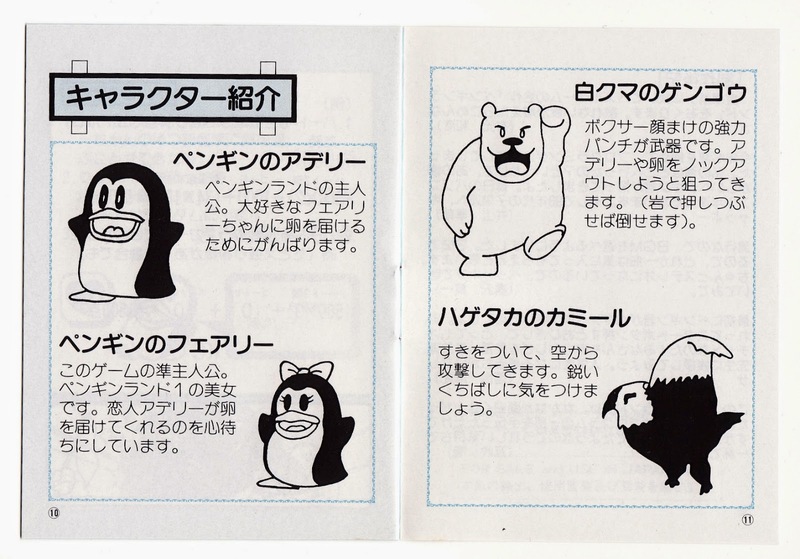 Penguin Land features an extensive cast of characters, as you can see in the pair of pages above. 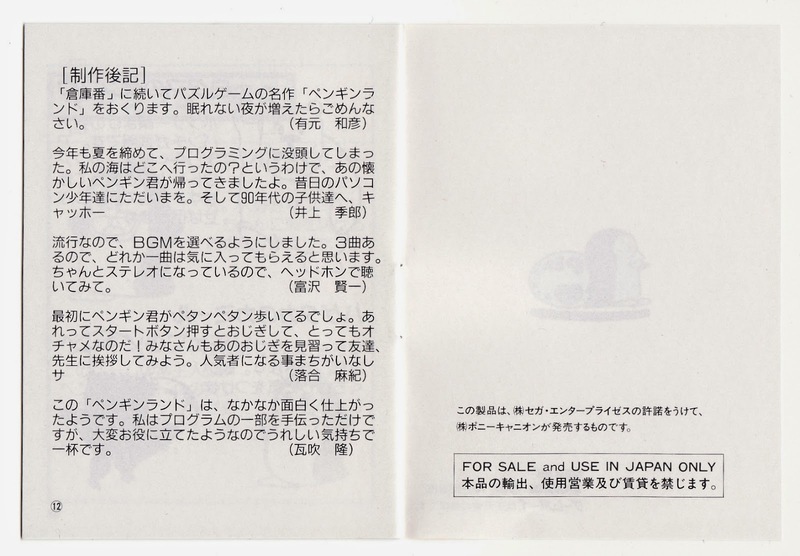 I don't suppose any of you can make out what's discussed on this last page of the game's instruction manual? Are we looking at gameplay hints or tips here, or is it just random details that didn't fit anywhere else?